We are always here for you and your pet. Contact An Emergency Vet Now! At the Central Toronto Veterinary Emergency Clinic we are dedicated to providing compassionate emergency care for our patients and their owners. Our Toronto veterinary emergency hospital operates with a skilled veterinarian and experienced technicians on-site 24 hours a day, weekends and holidays. Our goal is to exceed your expectations of Toronto emergency vet services by treating your loved ones with compassion, respect and dignity. We strive to provide the highest quality of medicine, alleviate pain, and ensure continual care and compassion in an environment where your pet is never alone. Upon arrival at our veterinary emergency clinic, a doctor will examine your pet together with you and then provide a treatment plan based on your pet’s medical condition. Throughout your pet’s visit, our compassionate staff will work hard to provide comfort and constant attention to the needs of both you and your loved ones. We are proud to have created a family environment where our clients feel welcome and respected while ensuring optimal care for our patients. During your pet’s stay and upon discharge, you and your referring veterinarian will be constantly updated and provided with the appropriate information needed to further care for your pet’s needs. Unlike other emergency veterinary clinics that require you to transport your pet to your regular veterinarian first thing in the morning, CTVEC can provide on-site continuity of care. Our emergency vet clinic will provide the care appropriate to the medical situation while coordinating with your schedule and that of your primary care veterinarian. Let us take the stress out of the the emergency care process. 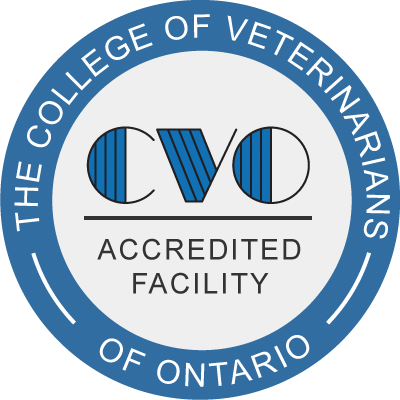 Make CTVEC your emergency vet in Toronto.